Please join us for a Wednesday evening dinner event at the Protected content in Old Town (Prague 1). 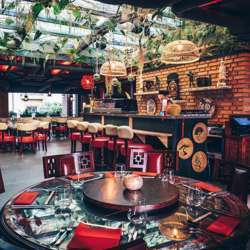 Enjoy unique Pan Asian cuisine in the centre of Prague. They offer a journey throughout Asia in one place. You can taste specialities from Japanese showgril teppanyaki, woku, the Indian oven Tandoor or delicious sushi from our sushi masters. All of it in an attractive environment that is divided into several parts including two bars and three lounges. In the restaurant, there is also an open kitchen so you have a great opportunity to watch the cooks at work. Conveniently located near the Právnická fakulta tram stop (line 17). The closest metro is Staroměstská (green line).